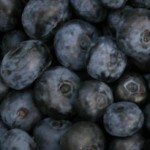 Summer is blueberry season and there is nothing like fresh blueberries to top off a bowl of cereal, bake in a pie, or just enjoy on their own. These are just a few tasty ways to celebrate summer. The juicy berries are also tiny antioxidant powerhouses. Anthocyanins, the blue pigments from the blueberry skin, are powerful antioxidants with potential cancer preventing power. In a study comparing 40 fruits and vegetables, blueberries had the highest antioxidant capacity, mostly due to the anthocyanin. More good news is that frozen blueberries are just as nutritious. So enjoy the health benefits year round! Try this antioxidant packed summer snack. In a large bowl, combine first four ingredients until well blended. Add blueberries and cantaloupe. Toss to coat. Serve at room temperature or chilled over frozen yogurt or angel food cake. Makes about 3 cups. This entry was posted in Nutrition Nuggets and tagged recipe, vegetarian. Bookmark the permalink.